I struggled a bit with naming this dish. Technically yes, it is a tart. However a tart suggests something far more elegant than this! I will try to pretty it up when I make it next time but I had to blog it because I thought it was so tasty. 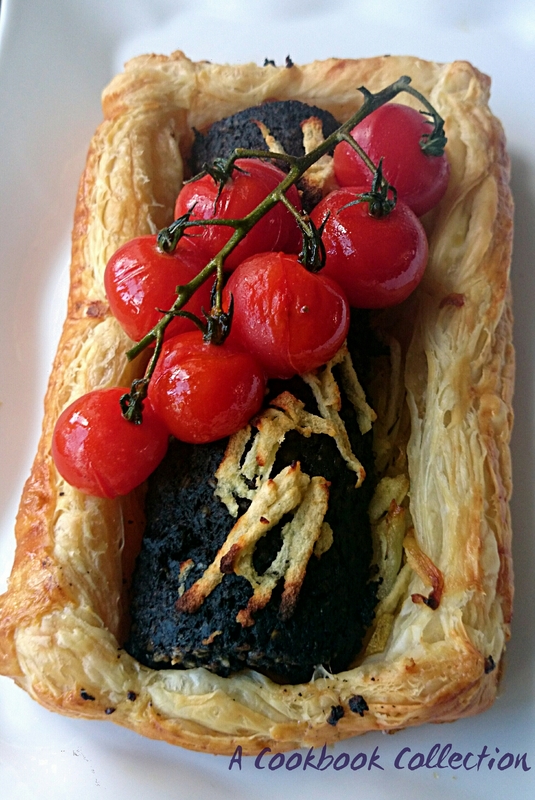 I love Clonakilty Black Pudding and I’m always on the look out for new ways to use it. The tart is very filling and really good option for a weekend brunch. It will keep you going all day! There are so many ways you could serve this, such as with a hollandaise sauce on the side but on this occasion I served it with a fried egg and the roasted tomatoes above. You could also completely encase in the pastry to make it like a sausage roll. The pudding really is the star of the show though. Heat the oil in a frying pan over a low to medium heat. While the onions are frying preheat your oven and peel and grate your apples. Don’t prepare the apples too far in advance as they will turn brown. Check your pastry packets instructions to give you a rough idea of temperature and how long to bake these. I preheated the oven to 220c/200c fan/gas mark 7. When the onions are cooked add most of the apple and stir through and remove the pan from the heat. Roll out your puff pastry and divide into 2 rectangles. I find it easier to put the pastry on to the baking sheet now and fill on the tray rather than trying to move it all in one piece afterwards. Spread ½ of the apple and onion mixture in a line in the middle of each of the pastry pieces. Cut the log of black pudding in half and put each half, flat side down on top of the onions. Or arrange it in as presentable a way you can! Sprinkle the rest of the grated apple on top. Beat the egg and brush it on to the edges of the pastry to help it brown nicely in the oven. Bake for about 20 minutes until the pastry is risen and brown. Oh drooling, I love black pudding! Thank you both, I adore black pudding too and this is quite tasty. I only discovered this morning that it’s made from beef and not pork! That must be why I like it so much.